It all started with receiving my GQRP SPRAT late in September 2009. In that wonderful publication was a project to build a simple regenerative receiver. In the fall of 1997, the Northern California QRP Club (NorCal) sponsored a contest. The contest objective was to design and build a functional amateur radio transceiver, using a maximum of 22, 2N2222 type transistors. 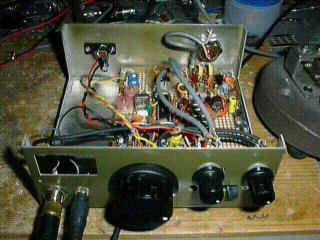 This is 40 Meter, 3 Tube Qrp Transceiver. 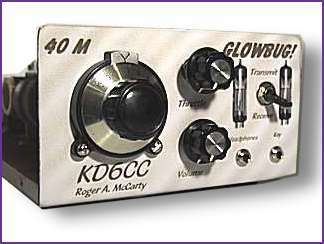 It has a Regenerative receiver that uses a 3A4, and a two tube transmitter using two, 3S4's for approximately 2 watts output. This project was born when talking with Carlos PY2CSU, we discussed about which transceiver type would be easy to build, with available parts and showing good results. After the 49er came this! 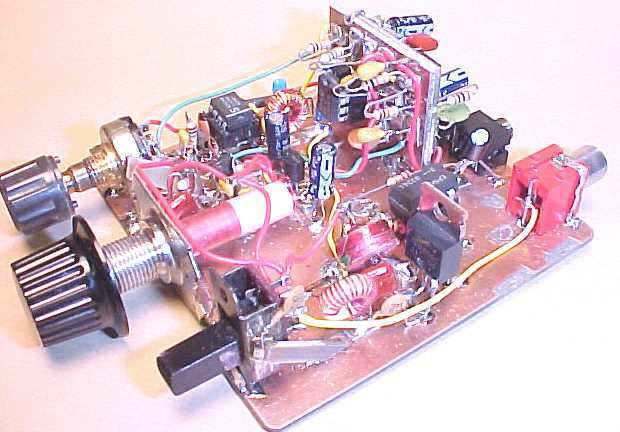 The famous Pixie is a little CW QRP, probabily the most popular in the Ham world. The schematics is easy to find over the internet, from brazilian to japaneses sites, in that way I find my first Pixie and a lot of mods. 7MHz is best band in order to make domestic QSO. But 7MHz ssb is too crowded to make QSO with QRP. Therefore 7MHz CW is best way to make domestic QSO. 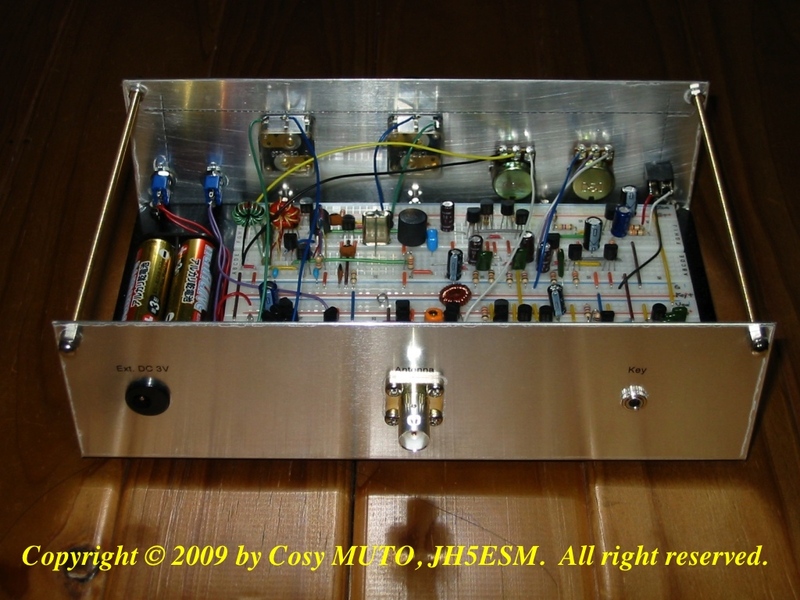 I will show you my handmade 7MHz CW QRP trx. A QRP transceiver for 7MHz CW only made of single kind of general purpose PNP transistor is presented. No other semiconductor devices (even diodes!) are used. The circuit is built on a solderless breadboard so that it is easy to build, repair and modify it. This was one of my very first transceiver developments. This page was also one of the very first circuit descriptions that I put on the internet quite some years ago. I had developed the 7 MHz CW TRX for my first trip to the US. The receiver worked very well. (Actually a lot better than here in Europe since they do not have high power broadcast stations on 7.1 MHz). Here is a rig that provides real challenge for the QRP home builder. Nonetheless, this is a classic circuit and a favorite in the QRP community. What is the MMR-40? It is a 40 meter rig with SSB (voice) and CW (Morse code) operating modes. 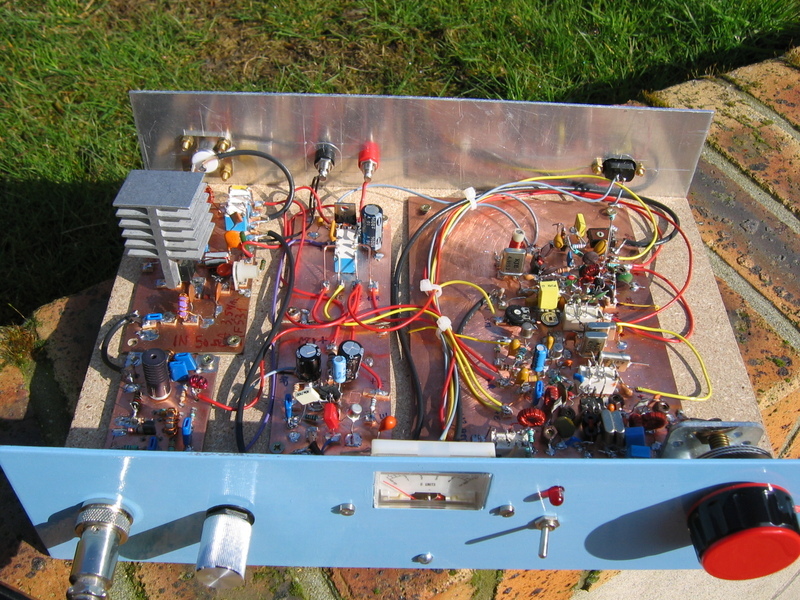 This is a low power (QRP) rig with up to 6 watts CW or PEP (peak envelope power) output. This rig was designed for the ARRL Homebrew Challenge. Following the experimentation with the 74HC4066 chip we decided to build a transceiver based in the receiver described here in this page. Mais um projeto de transceptor para 40m ? Não simplesmente um projeto, mas a reunião de muita coisa que aprendemos com nossas experiências. As principais novidades : No receptor O uso de pré-amplificador de RF, de um mixer a diodos balanceado (não duplamente) e um controle de ganho para o amplificador de áudio, trazem como resultado um excelente desempenho, podendo ser ouvidas estações de DX e o não saturamento do mixer com sinais fortes. Mais um projeto de transceptor para 40m ? Não simplesmente um projeto, mas a reunião de muita coisa que aprendemos com nossas experiências, agora na versão 2 As principais novidades : No receptor O uso de pré-amplificador de RF separado, de um mixer a TA7358 e um controle de ganho para o amplificador de áudio, trazem como resultado um excelente desempenho, melhorando a recepção das estações de DX sem o saturamento do mixer com sinais fortes. After the success of the CANARINHO and the CURRUIRA we decide to made a transceiver with the minimum number of discrete components. This is the CURUMIM. There are only 12 components! We assembly in two modules, we try some different audio circuits. But the audio amplifier using the LM386 was the best. This name and part of schematic are taken from 49'er where 40 represents the band, and 9 is 9V battery to supply the rig. In the last project with the 74HC4066, it it was acting as to mixer, buffer, oscillator VXO and driver in the Tx. In order to increase the power, I decide to substitute the VXO who uses na analogic gate of the 74HC4066, for a VXO using a BJT transistor. Now the two remaining analogics gates are in parallel circuit. 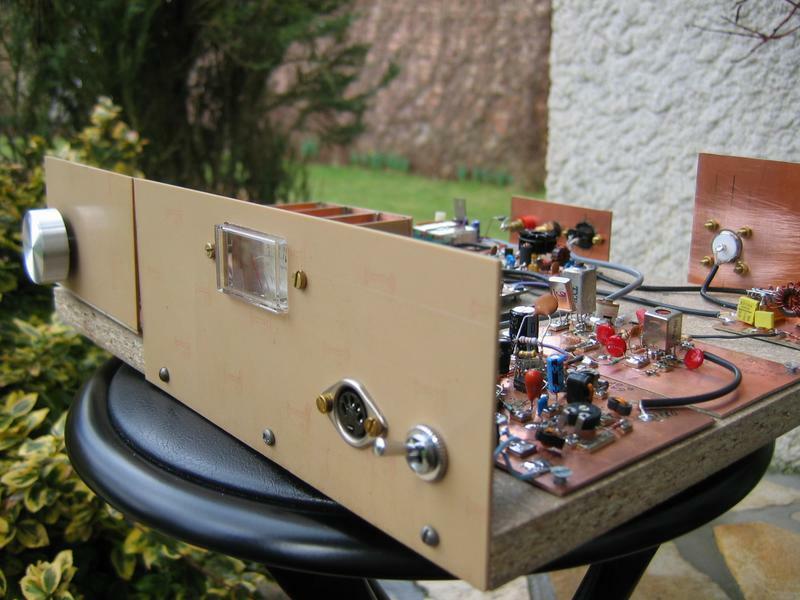 Homebrew 40m CW Transceiver. Frequency range 7.000-7.030 MHz. 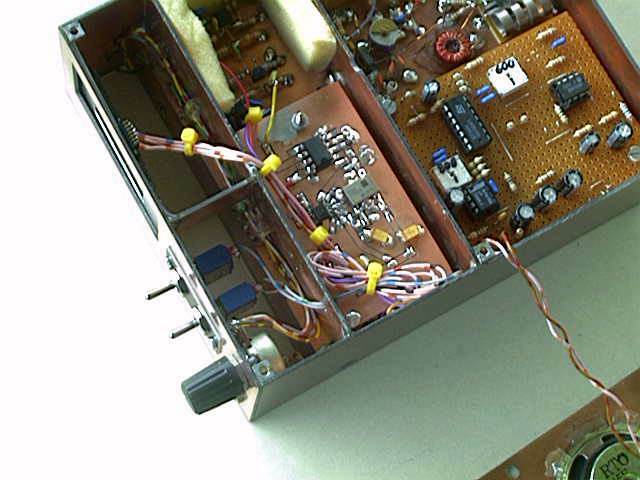 RX part: Superheterodyne with RIT and side tone. TX part: Output power 3 Watts with 7.5 Volts 1.0 Amps. 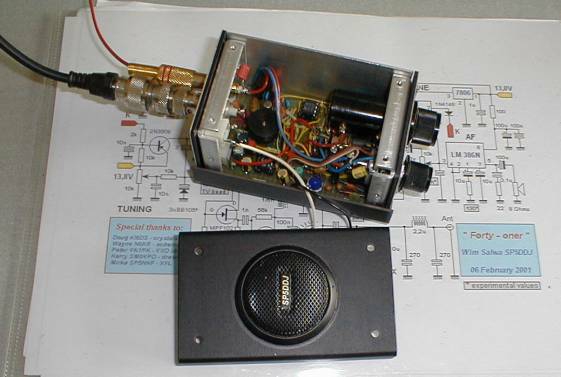 The idea for the JABAQUARA was born in the Yahoo list QRP-BR, where folks always spoke very well from the SW-40, then we resolved to take the enterprise of "tropicalize" the SW-40. 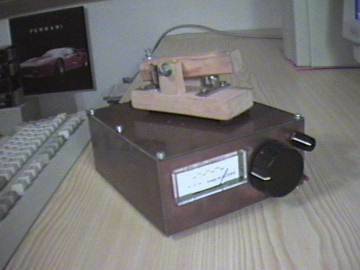 A transceiver with a DC phase receiver. I was surfing the WEB searching interesting things and I find a article of my friend Onno PA2OHH. We decide to copy the idea and thus the JABURU was born. Sometime back I was visited by PY2CQM ... As he gave an american book about RF as a gift, I asked him how could I repay for it... and this way I was without my super heterodyne transceiver for 40m and the JURITY project was born. We show here the "LACRAIA", a transceiver based in the 74HC240, an 8 gates inverter buffer IC. This transceiver was born from the experiments done using high speed digital ICs in radio frequency applications. This is the new Transmitter/Receiver rig for backpacking. It is 3 inches square. It is the same radio as the 80 meter rig. The PTO tunes 150 kc of the band. With one turn it tunes 12 kc. This was my first attempt at putting together a few "pet" circuits to make a transceiver. Special thanks to Mike, W3TS, and to Wes, W7ZOI, for helpful and much appreciated elmering. O transmissor é o "SOVINA" um TX classe E com alta eficiencia, descrito anteriormente. Já o receptor tem uma novidade : o mixer é o transistor PA sem alimentação de Vcc, o resultado é um otimo receptor, considerando a simplicidade. The all discrete component transceiver described below is a throw back to yesterday, when we didn't have fancy IC's to work with. In the QRP sprit of "doing more with less" I set out to design a no IC, VFO tuned transceiver with super-het receiver with reasonably good performance. I made a 7MHz CW transceiver by using the IC for the narrow band FM double super receiving circuit, MC3362P. I intended to make a transceiver for 10MHz band in the beginning. Voici la description d'un transceiver ultra-simple pour le décamétrique. La version décrite ci-après est monobande, mais rien n'empêche de la réaliser multibande. Ce petit transceiver CW, 40m , 1 Watt a été décrit dans QST de Novembre 1994 par Dave Benson, NN1G et republié dans « QRP Power » aux éditions ARRL. 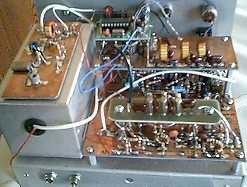 Ce transceiver a été calculé pour le trafic sur 7 Mhz, bande délicate car étroite et soumise à de forts signaux en fin de journée. Par simplicité, j'ai fait appel aux mixers actifs à cellule de Gilbert que sont les NE602 ou 612.